This double-sided outdoor beauty lives at Truck and Trailer (TNT) in Lloydminster. 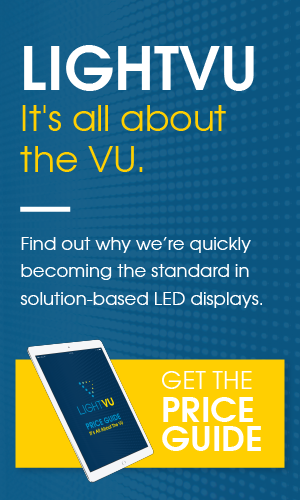 They heard about LIGHTVU’s design excellence and figured it was the perfect opportunity to design a beautiful new LED double-sided sign to display outside of their head office. Mark Silvius, principal of LIGHTVU, is particularly proud of this project. “Even the static elements of this design are quite beautiful,” he explains. Using a large Jupiter outdoor LED screen, LightVU was able to help the client showcase their brand to the world through an innovative and sleek design that was custom-made and tailored for them. Jeff Yu Manager of Ventures North Financial Group, who owns TNT, was in the market for an LED display soon after the old sign at TNT was damaged in a wind storm. He was impressed with LIGHTVU’s knowledge for LED products and their comprehensive, solutions-base designs, which includes content management. This allowed us to win the job and add to our list of LED displays in Canada. The TNT double-sided display is standing strong and continues to send out messages with explosive colour and quality. The sign, which stands tall facing Highway 16, is a custom design and attracts potential customers into their business. Through eye-catching content, TNT can advertise certain value-added aspects of the business, such as their financing. TNT is already attracting customers who would have otherwise driven right by without noticing them. TNT is very satisfied with their purchase and investment in LIGHTVU’s LED sign. Yu says that the sign, the LED portion specifically, is bigger and better than they had anticipated. The content management portion is putting the sign more over the top than it already is.